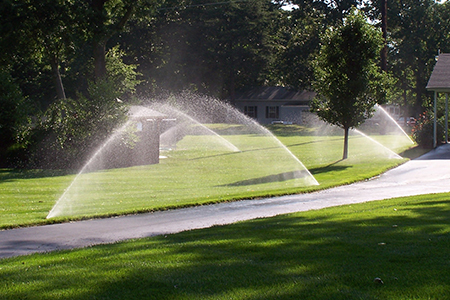 Irrigation system maintenance is a very important part of what we do as a company. A properly designed system that has been installed correctly will still always require seasonal adjustment and proper system start up/shutdown. A start up in the spring involves turning on the water supply, ensuring the proper function of the system, and repairing any item(s) that may have been damaged by snow, ice, or shifting of the ground due to freeze and thaw. Having a professional correctly adjust sprinkler heads will make sure that precious water isn’t wasted during the warmer months. 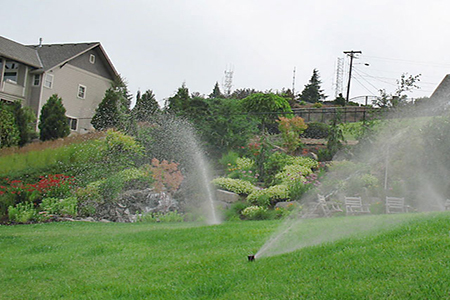 Additionally, because we are now installing smart irrigation controllers, proper landscape profile configuration in the spring will ensure that water is used as efficiently as possible. High season maintenance is also important. The adjustment or shifting of heads may be necessary to accommodate new plantings or construction. Controllers may also need to be adjusted (with smart controllers, this can now be done remotely) to account for changes in temperature. In the northeast, where we begin to experience very cold overnight temperatures in late autumn, it is important to make sure that your irrigation system is prepared to handle both prolonged inactivity and freezing temperatures. Irrigation professionals refer to this process as “winterization” and it includes shutting off the water supply, purging any additional water from the system, and removing system components to avoid damage. Please take a moment to look at our service options and maintenance plans. We offer a basic turn on, shutdown, and three agreements ranked according to the number of visits: bronze, silver, and gold. Silver agreement includes a Spring Start up, a Winterization, and one summer check up. Gold agreement includes a Spring Start up, a Winterization, and four periodic check ups. Drainage and removal of water from the irrigation system will be done using compressed air. The controller will also be disabled at this time. Winterizations are generally performed between mid September and mid November depending on weather conditions (Aqua Turf is not responsible for damage to the irrigation system due to early freezing weather conditions). Turning water on and checking system for adequate flow and pressure; checking system for any leaks or broken heads; adjusting heads for proper rotation; programming controller and checking battery backup. Spring Start ups are generally performed between mid March and the end of June depending on weather conditions (Please be sure that you schedule your irrigation system to be turned on before you have any landscaping done to your property).